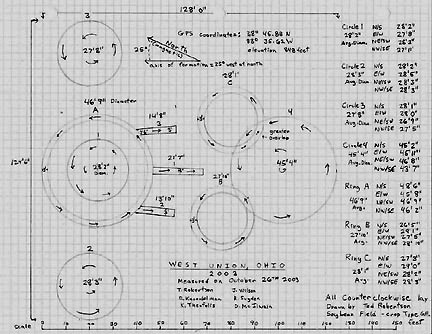 Upper circle flattened in soybeans was 45 feet 4 inches in diameter. All the other rings and flattened circles were about 28 feet in diameter. Field is in West Union, Ohio, south of the Serpent and Seip Mounds. The paths were made during the investigation. Aerial photograph © 2003 by Jeffrey Wilson. 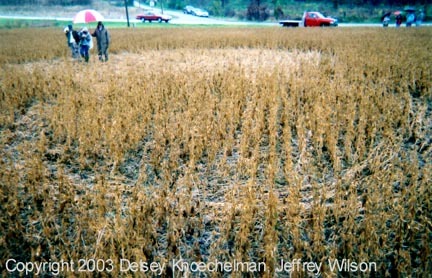 November 1, 2003 West Union, Ohio – This week, crop circle investigators Jeffrey Wilson, Roger Sugden, Ted Robertson, Delsey and Tony Knoechelman and several others went to see yet another crop formation in soybeans south of the Serpent Mound and Seip Mound where other soybean formations were found in August and September this year. This latest one was a little south of West Union on Route 41. The farmer and residents near the field thought the pattern first appeared in the soybeans in late September or early October. Aerial photograph © 2003 by Jeffrey Wilson. The farmer and residents near the field thought the odd pattern first appeared in the soybeans in late September or early October. Perhaps to avoid controversial publicity, no one had reported it early on. The farmer said he had not seen tracks or paths around the formation before the investigators began their work on the weekend of October 25-26. I asked Jeff Wilson how he compared this month-old formation with the other significant and mysterious soybean formations earlier this year near the ancient Serpent Mound in Locust Grove, Ohio, and the Seip Mound in Bainbridge. Jeffrey Wilson, Independent Crop Formation Investigator, Master’s Degree in General Science, Dexter, Michigan: “This was quite a puzzle to us when we arrived on the scene for a couple of reasons. 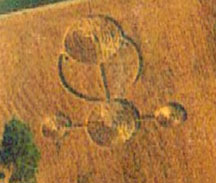 First, there have been very few crop circle formations in soybeans ever recorded in the U. S. And of those, few had been studied very well. This is the first one that we’ve looked at this late in the season where the soybean plants are dried out and ready for harvest. All the dry branches and leaves fall off and leave just the stem of the plant and the seed pods of the soybeans themselves. So, these West Union soybean plants were quite different than what we had seen in the previous formations at Serpent Mound (Locust Grove) and Paint Creek (Bainbridge). 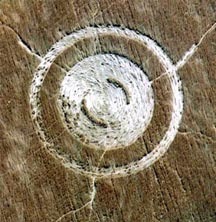 We do not have enough evidence to conclude one way or the other that the formation is authentic or that it was hoaxed. Ringed circle in dry soybean formation at West Union, Ohio. Investigators arrived in the rain on the weekend of October 25-26, 2003. Photograph © 2003 by Delsey Knoechelman and Jeffrey Wilson. Also, we believe after talking with residents who live near the field that it came down three to four weeks previous ­ either last week of September or first days of October. The formation had been down before there had been any frosts and there have been several frosts there. WHAT DID YOU FIND IN THE FORMATION THAT YOU THOUGHT MIGHT BE IN THE MYSTERIOUS CATEGORY? Although the field is dry and ripe for harvest, we were really surprised to discover eight stalks scattered in different places in the circles that were still green and alive and that had kept their branches and leaves. These were flattened right down with all the rest of the plants that are now dry and dead. To be honest with you, we are really puzzled about how this could be the case this late in the season and having these eight plants manage to somehow survive the frost and the lateness of the year. This is just really a puzzle. We don’t understand that at all. 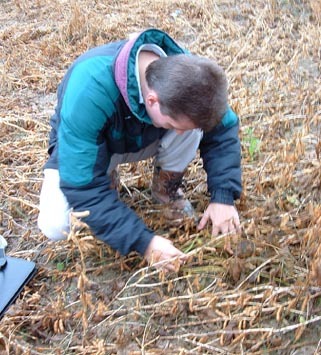 Jeffrey Wilson in West Union formation finding one of the eight green soybean plants amid the dry, brown plants ready for harvest. Photograph © 2003 by Delsey Knoechelman. Close-up, one of eight green soybean plants discovered by Tony Knoechelman in West Union formation. Photograph © 2003 by Jeffrey Wilson. Eroded, scorched?, section of stem on one of the eight green plants discovered in the dry, brown West Union soybean formation, similar to damage found in the Serpent Mound and Paint Creek near Seip Mound soybean formations in August and September 2003. Photograph © 2003 by Jeffrey Wilson. I UNDERSTAND THAT TONY KNOECHELMAN FOUND SEEDS IN THE DOWNED PLANTS OF THE FLATTENED CIRCLES THAT WERE LARGER THAN OTHER SEEDS IN THE FORMATION? Tony Knoechelman was in the largest circle and he was picking off some of the seed pods from different plants. One of the things that struck us right away is that where all the flattened plants were, there is a significant percentage that sprang back up. The crop formation was there a long enough time for some phototropism (plants rising back up toward the sun after having been blown down or pushed to the ground) to occur. So, there were a lot of stems that were standing back up. Tony took seed pods from those, opened them up and looked at the seeds and compared them to the sizes of the seeds that he had pulled from the plants flattened and laying on the ground. In the largest circle, phototropism apparently caused some soybean plants to rise back toward the sun, implying the plants had not been broken when the formation was created. 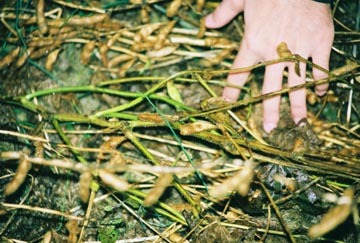 Also, seeds on the standing plants appeared larger than seeds in the flattened plants. Cause is unknown. Photograph © 2003 by Jeffrey Wilson. What he found was that the seeds laying flattened on the ground were significantly larger than the ones he had pulled from the standing plants inside the circles. That was a field observation, so we don’t know if that holds statistically throughout the whole formation. We did sample upright stems in the circles and we’re going to compare them to the ones flattened and to normal control plants that grew outside the formation. WHAT OTHER PLANT ANOMALIES DID YOU FIND? 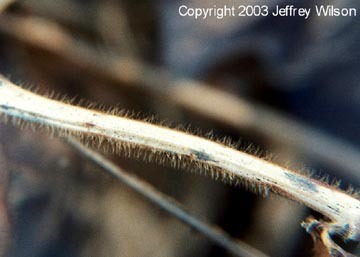 Soybean plants have a short fuzz that runs the length of the plant from tip to tip. But in this formation, the side of the plants upright (from phototropism?) in the formation that faced the direction of the flow (counterclockwise), that side did not have the fuzz. 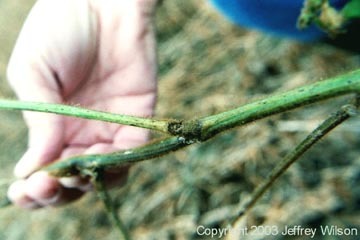 The hairs were all missing on that down-facing side of the soybean stalks, tip to tip. Normal soybean fuzz missing on one side of standing crop. Photograph © 2003 by Jeffrey Wilson. This struck us as unusual because if you were going to hoax a formation and use the typical methods of boards or a garden roller, you would have impact or scraping marks from the boards that removed only small sections of those hairs. But you wouldn’t mechanically remove it from tip to tip. But we’re not sure if that could be due to a weathering process. We don’t think so because it showed it only on the up right plants and their sides facing the direction of the flow. That was anomalous. The other find was that sometimes you find upright stalks in authentic formations in which all of the surrounding plants have flowed around the standing stalks. It’s a kind of subtle detail that many people miss, but the plants flow around the standing plants. In this West Union case, the plants did not flow around the standing stalks, but the plants had been flattened at one time and had come back up. (Phototropism is assumed.) What makes that kind of significant is that all of those plants must have been flattened at one point and were not broken. So, there is a significant percentage of the plants that were not snapped or broken. If you try to bend over soybean plants, it’s like trying to snap a celery stalk. Try to make a bend in the celery stalk. They break very easily. The fact that forty to fifty feet areas of crop were flattened and not broken, making it possible for some of the soybean plants to spring back up, I think, is unusual. DID YOU TALK WITH ANY OF THOSE PEOPLE IN THE HOUSE ON THE HILL OR OTHERS ABOUT WHETHER THEY SAW OR HEARD ANYTHING UNUSUAL THREE OR FOUR WEEKS AGO? We talked with a number of people in the area, not just the people on the hill. But the only person who reported anything unusual was the farmer’s wife who mentioned that she woke up about three weeks ago in the middle of the night and heard a low, mechanical humming sound coming from the field. But that was after the formation was there. She said the sound came about a week after the formation had been there. The sound that she described was exactly the same kind of sound that the land owner described hearing in association with the Bainbridge Paint Creek island formation. See 10/5/03 Earthfiles. 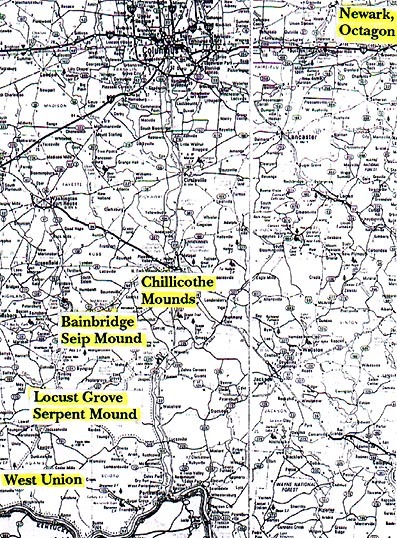 I ALSO MARKED ON A MAP AS I HAVE BEEN MARKING THE SERPENT MOUND AND SEIP MOUND FORMATIONS IN OHIO. WHEN YOU MARK WEST UNION, YOU REALIZE IT IS ALMOST A STRAIGHT LINE GOING NORTHEAST THROUGH THE STATE OF OHIO AND THE 2003 SOYBEAN FORMATIONS HAVE EITHER BEEN ON OR AT THE SIDE OF THAT LINE. 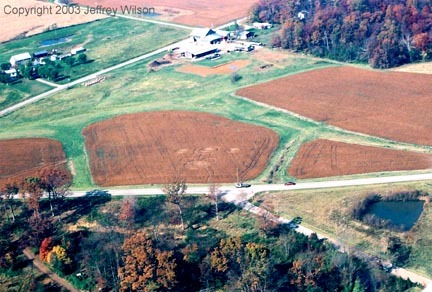 The four 2003 soybean formations at West Union, Serpent Mound, and Seip Mound are on an alignment with the Chillicothe and Newark Octagon earth mounds. Yes. And if you happen to extend that line southward into Kentucky, you’ll also come very close to a crop formation that was reported back in May in Flemingsburg, Kentucky. It falls pretty much on the same line. So, you have from Flemingsburg, Kentucky, going northeast to West Union, going northeast to Serpent Mound, going northeast to Bainbridge. They are all pretty much on the same line. HAVE YOU TALKED WITH ANYONE WHO STUDIES THE EARTH MOUND WORKS OR THE HISTORY OF NATIVE AMERICANS OR OTHERS IN OHIO. WHAT DO THEY THINK ABOUT THIS PARTICULAR LINE ORIENTATION THROUGH THESE GEOGRAPHICAL SPOTS? There have been numerous speculations about why this could be the case. If you want to relate it to something known archaeologically, there was a road that is now known as the Great Hopewell Road that extended from Chilicothe, Ohio to Newark, Ohio, where the Great Octagon is. That road was 60 miles in length and perfectly straight. Recently, the Ohio Historical Society has put together a documentary showing evidence for this road. In talking with some of the Native Americans in the area, their hypothesis is that these formations might be marking out a shift in the Great Hopewell Road, which they consider to be a sacred line that was laid out in the ancient past. If there is a shift in the line, it now needs to be remarked. That’s what is their interpretation. Aerial photograph © 2003 by Jeffrey Wilson. COULD YOU EXPLAIN WHICH IS WHICH? The circle with the ring and three line extensions from it is what the Native Americans consider to be the medicine shield. The circle that overlaps the two rings is what they consider to be the medicine drum. IT’S ALMOST LIKE SOME OF THE EARLY PICTOGRAMS IN ENGLAND. Yes, and I seem to recall a couple of formations that came down in Wisconsin a few years ago ­ one near Port Washington, Wisconsin. 1998 Port Washington, Wisconsin, pictogram in barley. Aerial photograph © 1998 by Jeffrey Wilson. The other was near Verona, Wisconsin. Both of those formations looked very similar to this West Union one, but the other patterns were in barley. They had the same kind of rough appearance and similar design. So I’ve seen this a couple of times, but this new formation is unique. There might be elements of the same style, but it’s definitely different. 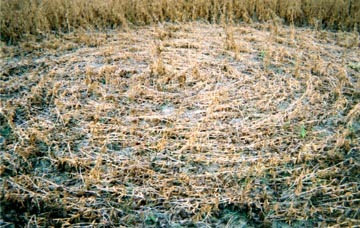 1999 Verona, Wisconsin, ring pattern in barley. Aerial photograph © 1999 by Jeffrey Wilson. Over ten thousand ancient mounds and earthworks once dotted the Ohio Valley which include the Serpent Mound, Seip Mound and a perfectly straight road 60 miles long called the Great Hopewell Road that extended from Chilicothe to Newark, Ohio along the same alignment that now stands out on my map of crop formations in Ohio in 2003. The ancient Earthworks of the Ohio Valley astonished European and American explorers in the late 1700s. 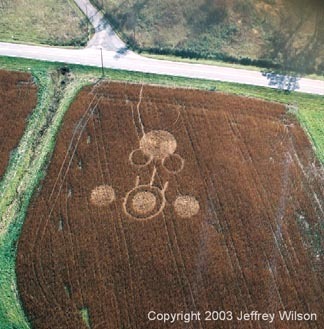 Now, it appears the Ohio Valley is joining England, Germany and other European countries as a place where truly mysterious crop formations have occurred in or near ancient sacred sites. 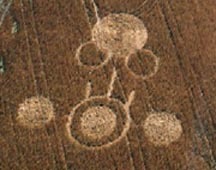 As I wrote in my book, Mysterious Lights and Crop Circles, could crop formations be connected to the same ancient intelligence which inspired other marks around the world in ziggurats, pyramids, stone circles and earth mounds? If so, we should continue to see patterns emerge in the crop fields around the Ohio Valley earth works. But always there is the question: what is the reason for the formations? Is the phenomenon here to stay? Or will it end one day in a final season of worldwide patterns as mysteriously as it began, without explanation and the haunting feeling that Something in another order of intelligence passed among us for reasons unknown. Upper circle flattened in soybeans was 45 feet 4 inches in diameter. All the other rings and flattened circles were about 28 feet in diameter. Diagram © 2003 by Ted Robertson.